The question has often been asked, what came first the salmon or the egg? This section strives to answer that question, although it will somewhat biasly begin with the egg. 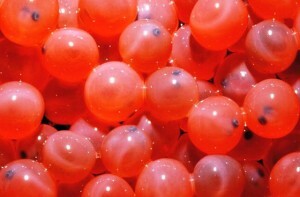 Stage 1: The salmon begins life as an egg. The eggs in the photo above are called eyed eggs because the eye spot is visible. This is also an indicator that the egg is viable, meaning that it was fertilized and is growing life. The amount of incubation time is temperature dependent, with higher temperatures corresponding with shorter incubation time. Stage 2: After the salmon hatches it is known as an Alevin. The Alevin does not yet have a fully formed mouth or digestive system. Instead it lives off the nutrients provided from its yolk sac. Stage 3: As the Alevin’s digestive system matures the fish gradually becomes a Fry. Fry have vertical stripes on the side of their body known as parr marks. These marks are the reason why this stage is sometimes also known as the Parr stage. Fry like the Egg and Alvin live in freshwater. Chum: No fry stage, this species heads directly to the ocean after emerging from the gravel. Coho: Average 2 yrs in freshwater depending on the river system, with fish from the more northern latitudes spending more time in freshwater. Pink: No fry stage, this species heads directly to the ocean after emerging from the gravel. Chum: Spend several weeks very nearshore followed by several months farther out in the estuary. 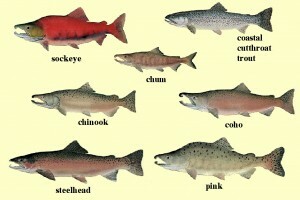 Sockeye: No documented time of sockeye spending time in the estuary. It is assumed that they head straight out to sea. 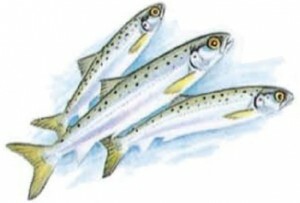 Stage 5: The growing Smolt eventually becomes the Ocean Going Adult. The Ocean phase leaves the nearshore waters and heads to the cold, open waters off of Japan and Alaska. Stage 6: After spending 1-8 yrs (depending on species and reproductive maturity) in the ocean, salmon return to their natal streams to spawn and thus the Spawning phase. 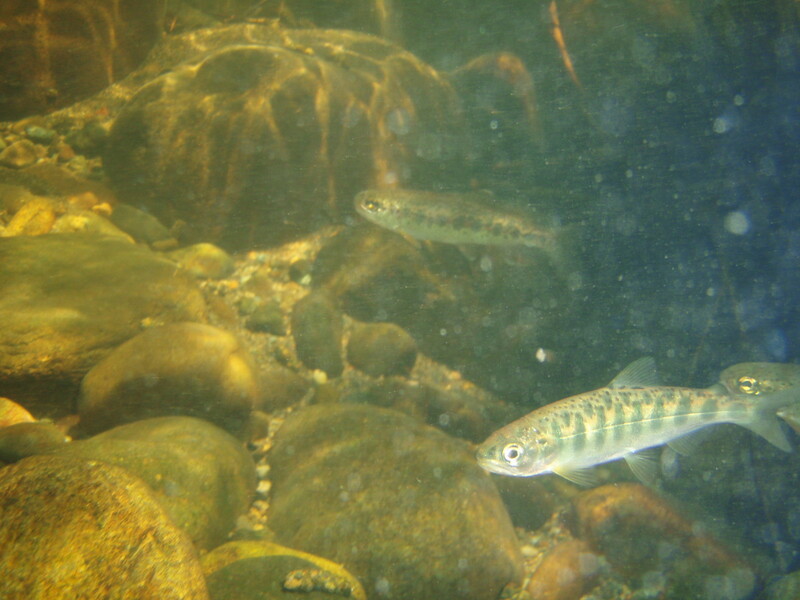 During migration salmon stop eating, and once freshwater is entered they have approximately 2 weeks left to live. Once mates are found and eggs are laid, the life cycle has officially been completed. However, there is one final phase for the Spawner. Stage 7: When the Spawner dies its body is called a Carcass. 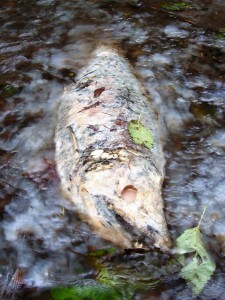 During this stage salmon streams can become rather smelly. This Carcass, however, is super important to the overall ecosystem as well as the next generation of salmon. The Carcass provides ocean derived nutrients to the forest, the equivalent of a 10-20lbs bag of organic fertilizer per fish. This influx of nutrients helps trees and plants in the riparian zone grow. Strong healthy plants provide erosion control keeping streams dirt free. Tall trees shade the stream keeping the first 3 stages of the salmon life cycle cool. Young salmon also feed on the invertebrates that break down the carcasses of the Spawners.